James Milner visited Help for Heroes Recovery Centre, Tedworth House, to meet some of the beneficiaries the James Milner Foundation has helped through its latest donation of £50,000. for Heroes Sports Recovery programme, beneficiaries were also able to work towards a Personal Trainer Diploma, thanks to the Foundation’s support. 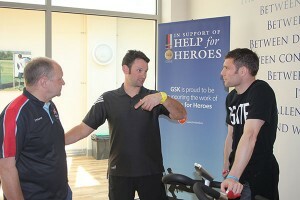 James met with Steve Arnold who lost his legs whilst serving in the Royal Engineers in Afghanistan. Steve took up hand cycling with Help for Heroes and in 2013 was identified as talented and joined the British Cycling Development programme.